Dwayne Johnson is pumping Hobbs and Shaw up to be one of the biggest movies of this coming summer. The actor posted a new photo from the set of himself alongside co-stars Jason Statham and Idris Elba, with them all looking pretty badass. The Fast and Furious spin-off has been in the works for quite some time and Johnson has been keeping everybody updated as to how everything is working out, and it appears to be all running very smooth. Dwayne Johnson is really good at keeping fans up to date on whatever project he's working on and Hobbs & Shaw has been no different. The actor has shared many photos from the Fast and Furious spin-off's set, but this just might be the coolest one yet. All three actors look like they're ready to take on the world, and possibly even each other. Johnson had this to say. "An exclusive lil' taste of biggest showdown the summer has ever seen. The Outlaw Lawman, Hobbs. The International Spy, Shaw. The Baddest Bad Guy the Fast & Furious franchise has ever had, Brixton. We're either gonna get along or we get it on. F*ck gettin' along, gettin' it on is way more fun. On a biz note, this film has been a fun one to produce and our global audience is gonna have an absolute blast this summer." Both Dwayne Johnson and Jason Statham have not been shy about their love of Idris Elba and what he brings to the table for Hobbs & Shaw. In a recent interview, Statham admitted that he had wanted to work with Elba for a long time and that his character is "just so formidable, so talented," Statham went on to say, "I've never seen a villain played to this kind of depth." Pictures from the set have shown Elba's Brixton character to look pretty cool, but we have yet to see what Statham has been hinting at. Jason Statham also recently revealed that the Hobbs & Shaw set has been a lot of fun, which echoes earlier and new statements from Dwayne Johnson. Putting Statham and Johnson together is already enough great chemistry, but throwing Idris Elba into the mix must have been an excellent time behind-the-scenes. Luckily, we won't have to wait too much longer to see what Statham and Johnson are so excited about. Hobbs & Shaw hits theaters on August 2nd, where it will more than likely dominate that worldwide box office, much like Jason Statham did with last summer's epic The Meg. We're still in the dark as to what the spin-off will specifically be about, but if it's anything like the Fast and Furious franchise, fans will be in for an action-packed movie with some pretty good humor thrown into the mix as well. 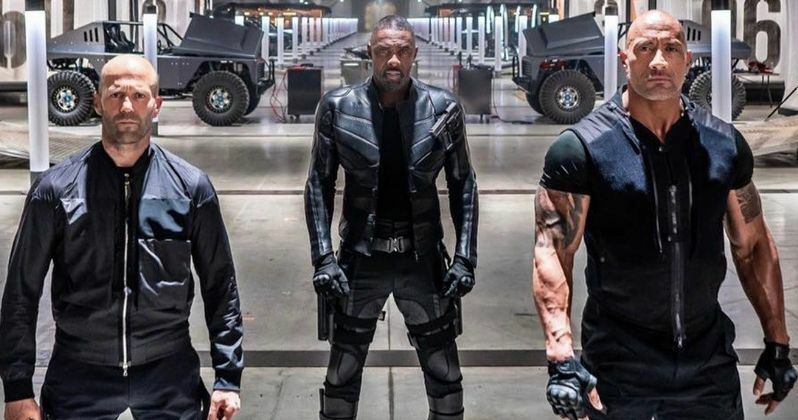 You can check out the latest look at Hobbs & Shaw below, thanks to Dwayne Johnson's Instagram account.